Make your own raincoat in our new workshop. Using the Closet Case Kelly Anorak pattern you will make a wardrobe staple raincoat. 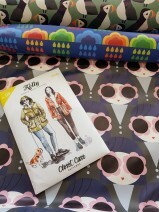 Choose from one of our three waterproof fabrics featuring fun prints, or bring your own fabric. The cost of the workshop includes the fabric and all notions. The class will be taught by our fantastic teacher Angela Walker. This workshop would be suitable for intermediate sewists.